Billy Bowie is always a presence at Rugby Park. Mostly, his influence at the club is marked by the three monster trucks carrying his name and the Kilmarnock colours that sit outside the stadium, but he is often to be found at the ground himself. His tanker services and waste disposal business is based only a mile away, so Bowie is able to make several visits a day if required. "There's definitely been more to it," he says of the workload, but with a warm smile. At times, it has seemed as though Bowie has inadvertently found himself being a key figure at Rugby Park. He initially offered to provide financial assistance, investing £250,000 early last season. His company had long supported Kilmarnock through sponsorship, but Bowie was moved to act through concern about the club's very existence. He has since invested a further £1.4m and been central to a debt reduction deal with the bank that has seen Bowie set up a new company to buy the Park Hotel and the majority of the club's debt converted to equity. Kilmarnock are now essentially debt-free, and Bowie rankles if he hears the club described as "cash-strapped" when the reality is that they are living within their means. "I would like to get away from [being seen as the money man]," Bowie said. "What I've put in is far more than I expected, but I was in a fortunate position where we could restructure the debt. It would be better to make the club work financially rather than to look for another investor. "If I was to put in more money then I would be letting myself down as well. We've got a budget forecast, we're working with that. "That's the best way to be, I don't want the club going back to bank loans. I'd rather we just got on with raising funds. "Kilmarnock has suffered a lot of job losses. We've lost Johnnie Walker, we've lost carpet factories and the thing that really got to me was what would happen if we lost our football club. That's when I came forward." Last season, committed and vocal Kilmarnock supporters campaigned against the stewardship of Michael Johnston. The discontent gathered momentum while several groups made attempts to buy out Johnston - then the sole director who had an 87% stake in the club. 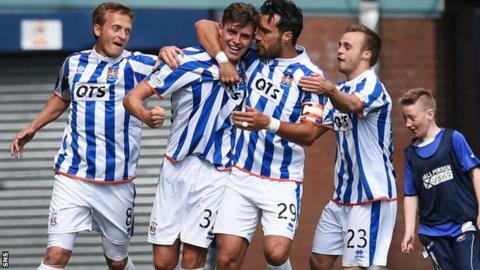 With a debt of £9.4m, Kilmarnock were hampered by their repayment obligations and a lack of trust between potential new investors and Johnston. Bowie's involvement and financial help enabled a route out of the impasse, and relations are improving around the club. Johnston now owns less than 50%, and there is a five-man board overseeing strategy and performance. Johnston can seem aloof, and some fans will continue to rail against him, but he is no longer decision-maker-in-chief. Before investing, Bowie carried out due diligence and pored over the audited accounts of the previous five years, concluding that under the circumstances the business had been run prudently. The problem was the size of the debt, since Kilmarnock could only ever service it. There are still challenges, since the Park Hotel provided an income stream that could be used towards working capital. Kilmarnock are in a healthy state in terms of finances and engagement, though, with plans underway to set up a community board that will strengthen local ties, and the team having returned to training at Rugby Park following the installation of an artificial surface. While Johnston remains involved in day-to-day decisions, and is Kilmarnock's representative within the governing bodies, Bowie is a hands-on director. He was working in England on Tuesday, but will travel back to Rugby Park to participate in candidate interviews for two key positions at the club and then take in the Ayrshire derby. "What I find with my own business is that I make a decision and we get on with it," he explained. "If it's the wrong decision, I've only got myself to blame. "On the football side, we've got our other directors we need to consult, so I find it a bit more frustrating because if a decision needs to be made, I've got to live with the conclusion being a week later. "A lot of people when I first got involved didn't speak to me, but now they're coming and saying they were surprised I did what I managed to do with the fellow directors. "At the games it's tough sometimes. With some of the supporters you can see their anger and sometimes it's not a bad thing to be put on the spot. So long as I've got some way of giving them an answer, I'll be quite happy. "[Johnston] does have a role, because I can't put in the time that Michael puts in. We need somebody like Michael here. There's this minority and I've been told that whatever is done they will see bad in it, but now they see the way the team is playing, good times are here." Bowie declined the opportunity to be chairman to retain focus on his own business. Ostensibly, though, he fills the role anyway. He is a self-made man, having started up his business with one truck that he paid for with £5,000 that took him eight years to save up. He knows what it is to work seven days a week and sleep in his truck at the side of the road, so the modest and affable nature should not be mistaken for naivety. A lot of people when I first got involved last year didn't speak to me, but now they're coming and saying they were surprised I did what I managed to do with the fellow directors. He invested out of emotion, but pragmatism underpins his involvement. Decisions will be measured for their long-term impact as much as for immediate concerns. One of the consortia that made an offer to Johnston last year was considering moving away from Rugby Park. The stadium's upkeep costs are extensive, and there is little likelihood of it ever being filled again - the Ayrshire derby is expected to attract more than 7,000 - but Bowie believes that the club needs to retain its home. Supporters can be attracted back and Bowie is keen to ensure that fans in straitened circumstances will receive tickets. During his own childhood, his parents could not afford to take him or his four siblings to games, or buy strips. His involvement with the club is rooted in his own experiences, as well as strongly-held belief that local business owners ought to contribute to the welfare of their community. "We've just got to cut our cloth to suit," he adds. "We're engaging the fans that we've got - we had 4,100 at the Motherwell game, which is about 1,000 more than last year - we just need to keep working away at trying to get the crowds back. "We've had the gutters all fixed, we're fixing handrails, we're putting in a clock, new dugout seats, and the generosity of local businesses has made that all happen. "It's the oldest football club in Scotland and it would be a shame to move it from here. "With the winters that we get now - believe it or not they make my business a lot of money - we need surfaces like [the new artificial one] to guarantee games. There are all sorts of different training sessions, we've got our own youth sides here, and they play all their games here now. The place has a buzz to it. "I'm convinced that we could have put that pitch in, told nobody and it would have taken two or three games for them to work out it was artificial. It looks like a nice green pitch." Bowie is passionate about Kilmarnock, the club and the town. Six of his articulated lorries carry the Kilmarnock colours, although this can occasionally bring unwanted attention for the drivers. Like everything he does, there is a purpose to the initiative. "We hired one to a company in Inverness and they said they were getting a fair bit of abuse after we beat Ross County," Bowie said. "We've had a driver who was parked in Dundee overnight and there was some banter with Dundee United fans. These trucks out on the road are big billboards and it's trying to raise awareness." Kilmarnock need Billy Bowie, for all that he brings to the club.